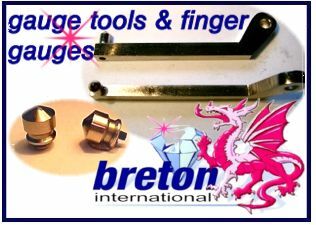 Breton International supplies world class gauge tools and finger gauges. These gauge tools, are used for measuring in-process grinding operations to avoiding stopping the machine, while sampling Finished products which save idle time of the machine. Our products are proven on applications with smooth and interrupted surfaces, and are used extensively in grinding applications on high precision parts. Breton gauging tips and fingers can be produced to your own specifications.